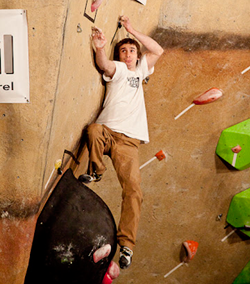 With the 2012 edition of ABS Nationals fast approaching many of America’s top boulderers headed for the east coast last weekend to participate in the finale of the 2012 Dark Horse Series. In a repeat of last year’s comp, Daniel Woods and Francesca Metcalf prevailed over a pretty strong field. Poor dude on the right of Daniel, talk about distracting. That’s Alex “Socks” Johnson formerly of Vertical Endeavors – Warrenville, IL – he’s the nicest kid. Thanks Climbing Narc for posting all the results!